Eat and Drink Italy sponsored a new prize at the recent Royal Scottish Society of Painters in Watercolour (RSW) open annual exhibition – with the winning painting being used as the brand image for its Tili wine collection. More than 500 paintings were submitted to the RSW’s annual event, with around 300 being exhibited. The directors of the family run business then selected a shortlist of 12 for the competition. And after not being able to separate the two favourite entries from artists, Pat Edgar and Paul Murray, the panel decided to plump for a draw with Edgar’s ‘Blue Dawn’ being created for white wines and Murray’s ‘Looking Out’ being used for the labels on the reds. Eat and Drink Italy director, Scott Morris, believes choosing two designs not only underlines the high standard of the paintings, but also better suits the very different taste and styles of the red and white Tili wines. He says: “The whole competition went brilliantly and seemed to be extremely well received by the artists and the RSW. With so many brilliant designs from so many great artists, we knew immediately it was going to be extremely difficult to pick a winner, but ultimately successful. The prize giving took place at a reception at the RSA Building in Edinburgh in late November and designers then set to work on turning the paintings into labels. The first exclusive bottles will now go on sale at Harrison’s Fine Wines in Crieff and online at winestore.co.uk in January. The winning painters were awarded with two crates of the wine each and were both delighted to see their designs appear on the Grechetto (white) and Assisi Rosso (red) wines. Paul Murray’s ‘Looking Out’ painting features three abstract figures on a beach. The Art teacher at Inverclyde Academy in Greenock, who is a member of the RSW and the Paisley Art Institute, says: “Obviously this was the annual exhibition which all the artists were going to be submitting paintings to anyway, but this competition definitely added a fair bit of excitement and a different element to proceedings. “I was delighted to win the prize for three reasons. Firstly it’s always great when any painting is bought, secondly the red wine is delicious and the third, and perhaps most important reason, is my name’s now on the label which looks great - so it’s fantastic free publicity. Pat Edgar, a professional artist from Dundee - whose late husband was the imaginative Fife painter renowned for what he called his dreamscapes, Robert Leishman - will now see her ‘Blue Dawn’ painting feature on the white wine labels. She jokes: “Paintings by artists like Picasso have featured on wines before so I’m delighted to now be included in that kind of company. “The competition was a lovely idea, the labels have come out looking fabulous and they even say ‘painting by Pat Edgar’ on them so the whole thing is very exciting. He has travelled extensively to Italy to source independent and artisan food and drink producers for products including olive oil, balsamic vinegar, sauces and home-grown organic spelt, jams and lentils. 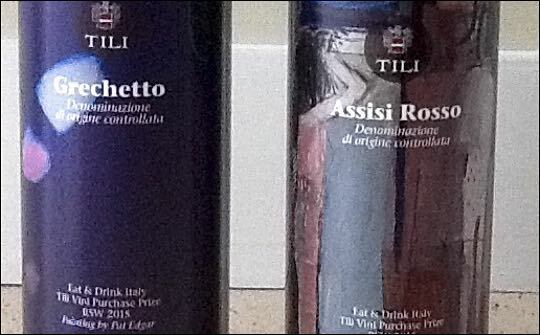 The Tili wine range is sourced from an independent family owned vineyard in Umbria. Scott adds: “There are a number of large retailers and well known restaurants which have shown an interest in stocking the wines and various other products we have sourced from the small high-quality producers we have discovered in Italy, so next year should be extremely exciting.